I had a Taylor Made r7 and recently tried out a Nike Sasquatch 460cc driver with a 10.5* face and immediately noticed the added length to my drives. The only problem is that this club is extremely inconsistant. I am not an advanced golfer by any means but I am at a consistant 10 handicap and have only seriously been playing for a year and a half. This driver may work well for those who are more experienced but as appealing as added length might seem, consistancy in hitting fairways is most important. I recomment the Taylor Made burner driver for accuracy and length. Have moved on to the burner and I must say it is a huge improvement and much easier to hit. So if you want to hit fairways, look somewhere else than the Nike Sasquatch. I bought my Sasquatch a year and a half and ago and I will never switch to another driver. You can rely on it going extremly far (20 yds >) and it is easier to hit straight. 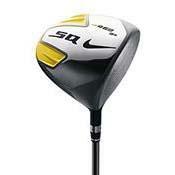 I am 15 and am a 1 handicap and I will stick with the Nike Sasquatch for as long as they make it! This driver did not work for me. The feel at impact was dead. For distance, it was shorter than any other drivers I tried. The big sweet spot was a plus and hitting it straight wasnt a problem. But my 7 wood went further than this driver. well i used to drive 300+ i now boom this mutha 300 to 340 i currently play of a +2 i tried the tour and ddnt like i as i was only driving 29000 cetimeters that driver sucked so i tried a nike sasquatch sumo to short i drove the green on my courses 340 yard in a medium tail wind buy this drivr if u suk it will make you a scratch golfer got it for $2000 at my local proshop reshafted top grip thanks future no 1. I purchased this club online for $199.00. I have used it in three nine hole rounds and can't believe the extra distance ( 20 yds. plus ) up to over 300 yds. This also is a very forgiving club, even in the toe area (slight fade)! I improved an average of 3 strokes per round (nine holes) in those first three rounds. Highly recommended. This is my first REAL driver (been using a 360cc Sam's Club knock off), and while it took some getting used to for me, I've grown to really like this club. Have a tendency to pull it, but when I take a good swing at it, it's almost always in play, and have occasionally sent it over the magical 300 yd mark. Really like this club!!! Put it behind the ball the first time and just had no doubts about making contact. this is an upgrade from the original boom stick (The Biggest B.B.). This driver is not ballooning on me at all. The times that I wave at this driver I get contact off the toe that is only tailing off into the the rough 5-8yds. mis hits still want to fly straight. I can never bring myself to swing easy on this club. Love it, hits straight and can't be missed.